Holkham Cottage is an attractive Edwardian house offering homely four star accommodation. Ideally situated for Royal Sandringham and touring coastline of North Norfolk. Dersingham is within easy reach of unspoilt beaches and nature reserves. Bird watching, cycling, walking, golf and riding all readily available. 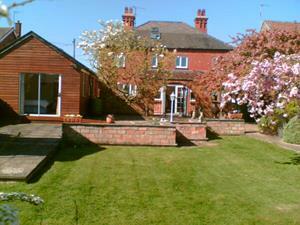 Holkham Cottage has beautiful private garden for guests with bbq facilities. All rooms are en-suite with colour TV and tea making facilities. We offer a quiet comfortable haven from which to explore the delights of West and North Norfolk. A ground floor twin room is available for your convenience. New extension for families - has wheelchair access and walk in shower. We have cycle storage and off road parking. We appreciated arrival times after 4pm (unless by prior arrangement as we can be flexible). Latest time of arrival 10.30pm. We can accommodate quiet well behaved dogs in our garden room. During colder months we can prepare home cooked evening meals by prior arrangement. In our beautiful garden we have a guests seating area, summer house and BBQ. Close to Peddars Way, Royal Sandringham, North Norfolk Coast - walking/bird watching/outdoor pursuits. Children welcome from any age. From A149 out of King's Lynn towards Hunstanton. At roundabout take Dersingham turning. Go through village for about 0.5 miles. Recreation ground is on your left, Holkham Cottage is on your right.